Students will be able to apply and use common suffixes to spell new words. Students will be able to recognise the word structure and patterns of words with suffixes. Review common suffixes with a quick brainstorm on a piece of chart paper. At the top of the chart paper, write the suffix -less and invite students to brainstorm as many words as they can think of that contain this suffix. As students name the words list the words on the chart paper under the suffix, -less. Continue with the suffixes -estAnd -ful, using the same process. Tell the students that they will be learning how to use more difficult suffixes to spell words. Display the prepared chart paper on the board with the new suffixes and meanings. Using six words from the suggested list (enjoy, America, friend, art, ideal, and absent) show the students how you can reference the suffix list and choose the appropriate suffix to create a new word from each of the words. Write the newly created words on the board, colour-coding the suffixes by writing the suffixes in a different colour: enjoyable, American, friendship, artist, idealism, and absence. Tell the students that now they will be practising how to add suffixes to existing words and create new words. Distribute one grid to each student along with a set of counters or bingo chips. Display the word cards in a pocket chart or tape them to the board. Tell the students that they will be playing a game of suffix bingo. Ask the students to write one word in each space. Words can be mixed up. Ask the students to use the words to create new words with the suffixes listed on the board. After all students have finished, take the cards down from the board and use them as bingo cards, drawing a card and calling it out. When a student gets bingo, ask for the student to tell you both the word and the new word they wrote with one of the suffixes. 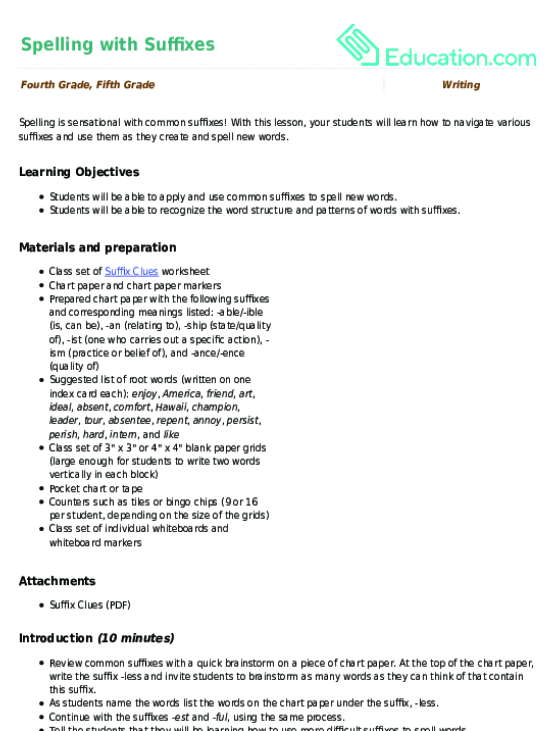 Ask the students to complete the Suffix CluesWorksheet. Reteach and give students examples of similar words with suffixes. Challenge students to create a flowchart or visual that shows the progression of words before and after suffix additions. Invite students to electronically colour code the suffixes for the words studied. Write several words with suffixes on the board, some spelled correctly and others spelled incorrectly. As you point to each word, ask the students to give you a hand signal (such as thumbs up/thumbs down) indicating whether the spelling is correct or incorrect. If the spelling is incorrect, ask students to write the correct spelling on their individual whiteboards with their individual whiteboard markers. Divide students up into pairs. Challenge the students to create as many words with the suffixes from the lesson as they can. Tell the students that the first person will write the word without the suffix and the second person will add the suffix. Invite pairs of students to share their brainstorm with the rest of the class. Spelling will be a breeze for students after they complete their understanding of suffixes with this final exercise in the series. 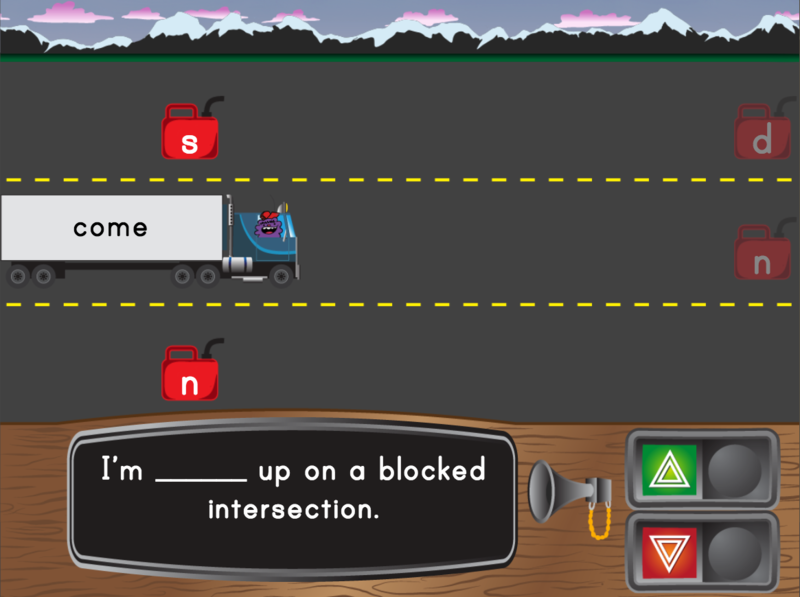 Kids must add or remove letters to add correct suffixes in this fun truck game! 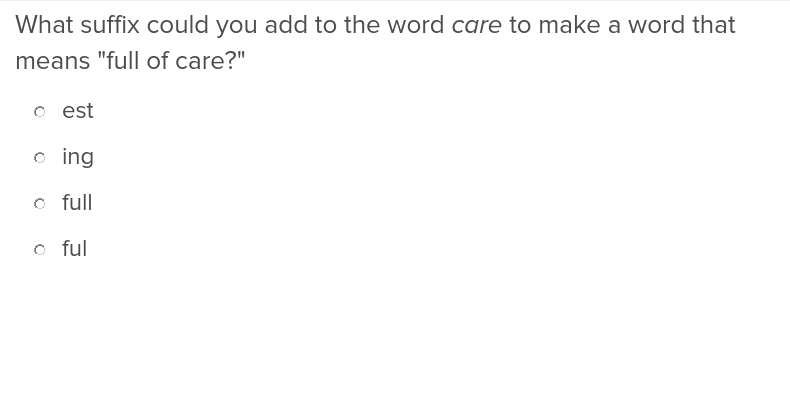 Teach students how to change the meaning of words by adding suffixes with this simple exercise. 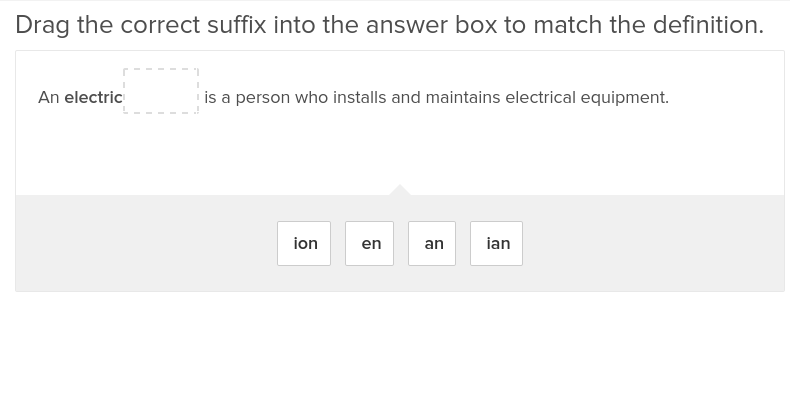 It doesnât take long for flashcard drills about prefixes and suffixes to get old. 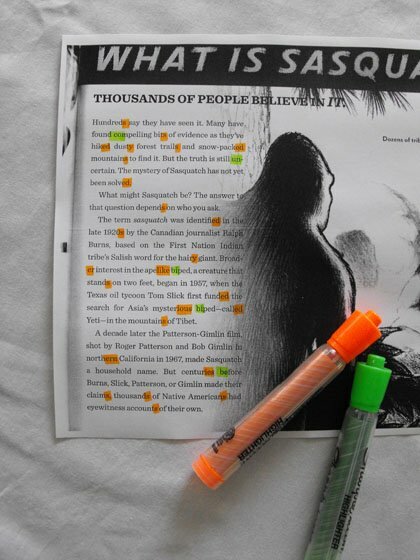 Turn the learning process into a treasure hunt with this fun activity! With a few clues and some common suffixes, your students will practise transforming words. 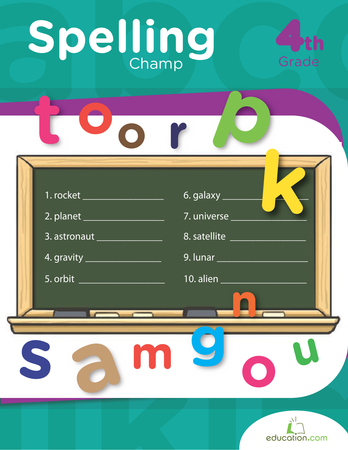 Assess your students’ knowledge of spelling patterns and commonly misspelled words.